I have a dataset that shows the borehole yield for fractured aquifers in South Africa. 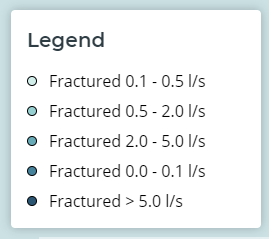 Using the "yield_ls" column, my CARTO VL legend looks like this (notice how the 4th item should be the first). But the legend remains the same as before. Is there a better way to correctly arrange the legend, or possibly move an item up or down in the legend order? I think the problem here is that you're passing directly the attribute ($yield_ls) to the ramp expression, and the results are sorted by number of occurrences of each category. 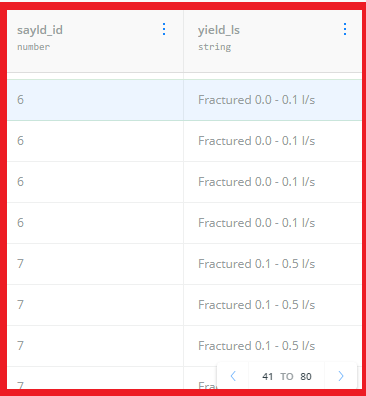 "Fractured 0.1 - 0.5 l/s"
"Fractured 0.5 - 2.0 l/s"
In this case, $yield_ls is a categorical attribute, you have to make sure that all the values passed to the buckets expression ("Fractured ...") match perfectly with all the category names you want to classify. Not the answer you're looking for? Browse other questions tagged carto spatial-database carto-vl or ask your own question.